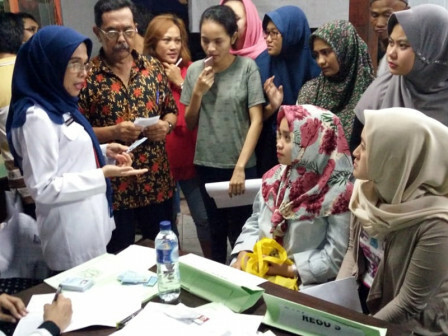 Population Operation (Binduk) serves 133 Cipinang Muara Urban Village residents, Jatinegara, East Jakarta. This operation is held at Aula Serba Guna, Jalan Catur Tunggal RT 14/01 Cipinang Muara, Jatinegara, East Jakarta.
" This Binduk service is not only for newcomers, but also DKI residents"
East Jakarta Population and Civil Registration (Dukcapil) Sub-dept. 's Information Data and Monitoring Section Head, Budi Mulyaningsih stated, Binduk is done on Wednesday night at RT 05, 06, 07, 12, 13, 14 of RW 01 Cipinang Muara. It is not only serves newcomers but also Jakartans since his side also provides e-ID recording equipment. "This Binduk service is not only for newcomers, but also DKI residents. Even there are many e-ID recording done and we distribute many e-ID cards and birth certificates not like usual days," he stated, Thursday (9/6). According to him, from total 133 residents served, 80 people receive temporary domicile certificates (SKDS)s, 16 people receive birth certificates, 17 people served for e-ID recording, and 20 others receive e-ID cards. "Especially for birth certificate, their data have been received in Binduk then we process it in Sub-dept. office. After all is done, we will issue their certificate and give it to them directly," he informed. This Binduk service is done by 87 joint personnel from Dukcapil Sub-dept., Satpol PP, Social Sub-dept., Urban Village, Sub-district apparatuses, and other units.